I can summarize my impression of Microsoft's Surface Pro 3 tablet PC in a single word: "Finally!" But that wouldn't make for a very informative article. So let me explain in a bit more detail. In the Surface Pro 3, what Microsoft has given us, for the first time, is a tablet that can truly replace a traditional notebook. And really that's understatement. For those involved in creative production — whether student or faculty — the Surface Pro 3 is vastly superior to a traditional laptop. What makes the Surface Pro 3 unique among tablets is the combination of size, display quality and pressure-sensitive stylus input — coupled with processing power that rivals mid-range traditional laptops. At 12 inches, the Surface Pro 3's display brings much needed screen real estate to those who do more than just browse Web sites or watch videos. Add to that a fourth-generation Intel Core processor (a 1.9/2.5 GHz Core i5-4300U in the case of the pre-release unit I'm reviewing, but up to a 3.3 GHz Core i7 in shipping models), and this is truly a fully functional computing device. It can do anything any Windows-based computer can do, and it gives you enough screen room, RAM (8 GB in my unit) and storage (256 GB internal, plus SD card slot for internal storage expansion and USB for external storage) to do it comfortably. Yes, it can run office applications, which Chromebooks, iPads and Android devices can do as well — in their own way. But it can also run serious software, from Adobe's Creative Suite to high-end 3D modeling and animation tools like Autodesk Maya 2015. That differentiates the Surface Pro 3 from all "media tablets" — which is to say Android and iOS tablets — designed primarily for consumption and light use of word processing or other productivity tools. 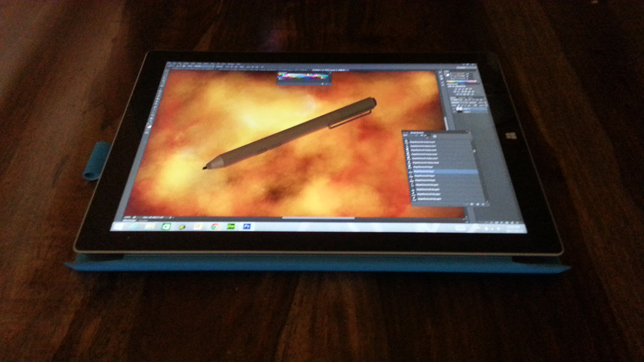 Unlike the original Surface RT, the Surface Pro 3 can run high-end graphics, video and 3D animation software like Photoshop (pictured), After Effects and Maya. Further, the Surface Pro 3 comes standard with a fully pressure-sensitive stylus, which means that for creative apps like Photoshop, Synthetik Studio Artist, Core Painter and Ambient Design ArtRage, you can not only draw directly on the screen, but you can take advantage of pressure-sensitivity to make the experience much more natural and intuitive. And this, to me, is what makes the Surface Pro 3 really exciting. To get a good interactive pen display this size — say a Wacom tablet, of which I'm a fan and which I have owned and used extensively throughout the last two decades — you'd have to spend about $1,000 — about the same as the Surface Pro 3 itself. The Surface Pro 3's pressure-sensitive stylus gives users a more natural drawing and painting experience. Now, there are some differences between a Cintiq and the Surface Pro 3. The Cintiq supports pen tilt in addition to pen pressure; the Surface Pro 3 stylus, made by N-Trig, does not. The Cintiq's stylus is battery-free; the N-Trig stylus is a Bluetooth device and requires a battery, though I have to add that I've been using this machine continuously for more than two months and have yet to deplete the battery that shipped with the pen. And it's worth noting that the Surface Pro 3 is fully compatible with Wacom tablets, so if you happen to own a Cintiq already or want to plug in an Intuos Pro tablet, you are in business. On top of that, the Surface Pro 3 is touch-sensitive (up to 10 points), so you won't ever have to switch between stylus and mouse/trackpad. It ignores finger/palm input when the pen is close to the display, but lift the pen away from the screen, and you can type on the onscreen keyboard, use gestures and otherwise interact with the computer without much fussing. As far as the responsiveness of the N-Trig pen itself goes, it's on par with Wacom styluses. There's very little parallax between the tip of the pen and the image that appears beneath it. So it feels like a natural experience. The pen also includes two programmable side switches (click, right click, etc.) and an eraser-end switch that, when clicked, instantly calls up Microsoft OneNote no matter what application you're currently running. So it's very handy for taking notes and organizing one's daily ephemera. So what else does the Surface Pro 3 have going for it? Unlike previous models, the Surface Pro 3 has a kickstand that allows the tablet to stand nearly upright or lie at a slight incline — or anywhere in between. It also has a USB 3.0 port and a mini HDMI port. As previously mentioned, a microSD slot allows for internal storage expansion. The new power cord attaches much more easily than the original Surface's cord. Though heavier than tablets you're probably used to, the Surface Pro 3 is nonetheless fairly lightweight, coming in at 1.76 pounds. That's lighter than the MacBook Air. It's also thin, measuring just 0.33" (0.55" with optional keyboard). While the Surface Pro 3 is a true tablet and designed to work without peripherals like keyboards and trackpads, the reality is that physical keyboards are just more convenient to use in a whole lot of situations than virtual keyboards. For one thing, they don't take up space on the screen. And for another, they are more responsive than virtual keyboards. The Surface Pro 3 keyboard is, unfortunately, a $130 option. That brings up the base price of the Surface Pro 3 by more than 16 percent for something that is too useful to skimp on. Is it worth $130? A gaming keyboard with mechanical switches is worth $130. The Matias Tactile Pro is worth $130. The old Apple Extended Keyboard II was worth $130. The Surface Pro 3 keyboard? It's good. It's superior to my MacBook Pro's keyboard, to be sure. And given that I mash a keyboard all day for a living, that's a fairly important consideration for me. I think the keys respond well to my input. The trackpad has been just outstanding (contrary to some reviewers' comments). It's very easy to attach or remove from the tablet. And the sueded texture is nice, though not entirely dirt-resistant. But $130? Nah. I don't know what the cost of manufacturing this keyboard is to Microsoft, but I'd guess there's a bit of margin-inflation happening here. Still, even with the $130, the pricing on these systems is very reasonable for what's being offered: a powerful Intel system in a tablet form factor coupled with a pressure-sensitive stylus. As far as performance is concerned, the Surface Pro 3 is a standard Intel-based system. It's available with a fourth-generation Core i3, Core i5 or Core i7 processor, up to 3.3 GHz. It's speedy, but of course it lacks dedicated graphics, so it's not going to compare with very high-end laptops on computing tasks that benefit from a dedicated GPU. But of course, systems with dedicated GPUs are considerably more expensive. The unit I have in my hands is pre-release (both hardware and software) and is actually slightly less powerful than the Core i5 models available at retail now, and for that reason I'm not comfortable publishing benchmarks. But I will say that it performed on par with similarly equipped systems in my favorite benchmarking tool, Cinebench from Maxon, which measures both CPU and graphics processing power. The unit I'm testing is equipped with 8 GB of RAM, and I ran into no troubles running Photoshop, Illustrator Dreamweaver, LibreOffice, Chrome, Internet Explorer and a few other apps simultaneously over extended periods of time. Operation has remained smooth and crash-free for as long as I've had this tablet in my possession, which is especially impressive given that this is a pre-release model. In short, it's been an absolute pleasure to use. Two Core i7-4650U models (3.3 GHz, Intel HD Graphics 5000) with either 256 GB or 512 GB internal drives ($1,549 to $1,949 MSRP). The Surface Pro 3 stands out as a significant advance in fully functional mobile computing. It has the power of a mid-range laptop coupled with the portability of a tablet combined with a new, larger display that I think for the first time offers a really viable option as a complete, permanent replacement for a laptop. It has an integrated graphics tablet, which, for my money, is worth the price of admission almost by itself. It has the optional keyboard that gives it all of the functionality of a laptop when needed. And it's built around a platform that allows users to switch from consumption mode to production mode effortlessly. I have no reservation highly recommending the Surface Pro 3 for those who need something that will serve as more than just a highly portable Web browser or e-book reader. This is a versatile device that will serve users well across a very wide range of activities and academic disciplines. Nor do I have any reservation giving it this publication's first Outstanding Technology recommendation. It's a recognition that's well deserved. Complete details are at microsoft.com.